Spring is its own special time of the year for timeshare vacations around the globe. Paul Casciato at Rueters has edited a list of places where April and May weather is delightful and the spring season is in full bloom. Part 2 of our two-part series takes a look at four more great spring destinations were budget-friendly timeshare rentals and great timeshare exchanges are waiting for you. When you talk about vacationing in the Bahamas, you’re biting off a pretty big chunk. This Caribbean archipelago is made up of 29 main islands, 661 cays (low-level sandy islands formed on the surface of coral reefs), and 2000 smaller islands spread out over 100,000 square miles of sparkling blue ocean, starting just 50 miles off the coast of Florida. It has the third largest barrier reef in the world, in what many consider the clearest water on the planet. The Bahamas is ideal for some springtime fun-in-the-sun, and when you travel there in April and May, you’re not only beating the summer tropical heat but you’re getting in ahead of hurricane season as well. Perfect springtime weather is a great draw to the Bahamas. You can find great timeshare rentals in the Bahamas to fit just about any budget and any style. 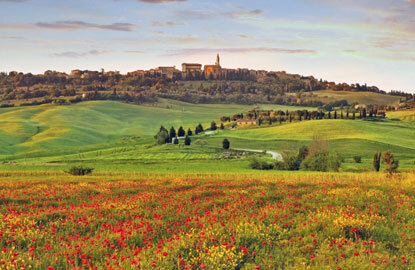 Italy’s sweet spot is April and May, which makes it a must-consider destination during the spring. Italy’s weather is best during these months, especially in beautiful Tuscany, and since it’s just before the summer peak season, the crowds are much smaller allowing for easy access to the true local experience such as sitting at an outdoor café with a cappuccino. You also won’t want to miss the FabricaEuropa International Festival in Florence held every May, a celebration of art, music, and photography with both exciting exhibits and fascinating workshops. There are great Italy timeshare rentals and timeshare exchanges available. Known as a top destination for Spring Breakers, the trick to enjoying the spring travel values and still avoid the spring break crowds is to go mid-April into May. The beautiful spring weather continues during this time, and the miles of white sand beaches along the shores of crystal clear waters are perfect this time of year. The Riviera Maya area is just south of “Mexico’s Caribbean Jewel” of Cancun, and includes such popular destinations as Playa del Carmen and Cozumel. Nightlife is a’plenty, but so are quieter pursuits such as sunbathing and snorkeling, and even adventure with tours of the local Mayan ruins. There are many budget-friendly Greater Cancun timeshare rentals available. Springtime in Paris is so spectacular that it has been immortalized in many a song. During April and May you can enjoy the city with plenty of sun and perfect temperatures as you stroll along the Seine River and take in views of the city from atop the Eifel Tower. Relax a moment in one of the city’s many little parks and inhale the remarkable fragrance of a French spring. Also remember that the lovely Loire Valley and the ritzy French Riviera are just a quick train ride from Paris, and both are truly stunning during the months of April and May. Find a great deal on a timeshare rental in France. If you don’t see a timeshare rental or timeshare exchange for the destination and date you want, just put a listing on RedWishes.